Here we are, already halfway through the Countdown to the Championship, with three races in the books and three more left to complete the 2015 season. Where do things stand and who looks like they might be tough to beat with just a few events remaining? In Top Fuel that’s a pretty easy question as it’s been all the Antron Brown show. He’s won all three events so far and pulled out to a 94 point lead over teammate and defending champion Tony Schumacher. Schumacher has not given up by any sense of the imagination, and it’s not impossible. If Brown can pull out by 94 points in three races, Schumacher could make up that deficit. Of course, Brown had to win three races to get that lead so Schumacher might want to plan to do the same. Funny Car has been an interesting category. It was Del Worsham, quietly flying under the radar all season, who got off to a quick start, winning the first two races. Meanwhile, Fast Jack Beckman, who looked like the man to beat, got off to a rotten start. Beckman conjectured he’d need to win the race and set a national record to get back in the fight. Then he went out and did just that and as he thought, he is indeed back in this fight, just 16 points behind Worsham. The man how has been riding that “Prock Rocket” all season isn’t giving up that easy. This could be a battle if Worsham can bring the fight back to him. Defending Pro Stock champion Erica Enders raced her way out of the gate with a win at Charlotte and a final round appearance at St. Louis, drawing out a good lead, but stumbled a bit with mechanical woes in Reading. Meanwhile, second place driver, and from the looks of it all season her main competition, Greg Anderson got off to a slow start but capitalized by making it to the finals in Reading, closing the gap to 72 points. Anderson has some ground to makeup but he’s been stout for most of the year and he certainly doesn’t count himself out either. Eddie Krawiec carried the Harley Davidson torch through the regular season, but in the playoffs it has been Andrew Hines running for the finish line. Either way, it does look like it’s shaping up to be another Harley Davidson kind of year, with Hines and Krawiec topping the standings. Hector Arana, Jr. is the next closest guy and he’s 101 markers back. * John Force will carry the red Traxxas colors on his car this weekend for the AAA Texas NHRA FallNationals. Daughter Courtney will continue to run the pink Traxxas car in support of breast cancer awareness. * Summit Racing drivers Greg Anderson and Jason Line, along with Summit Racing/BIGFOOT monster truck racer Dan Runte, and Harley Davidson riders Andrew Hines and Eddie Krawiec will be making the trip once again to the Middle East to visit U.S. soldiers during the off-season for “Operation Appreciation.” This annual trip is something all the drivers look forward to. The visit is made possible by Armed Forces Entertainment. Fans can follow the Operation Appreciation trip on Summit Racing’s blog, OnAllCylinders. * NHRA senior vice president of racing operations Graham Light was one of 38 inaugural inductees to the Canadian Drag Racing Hall of Fame in Montreal on October 9. The inductees included racers, crew chiefs, mechanics, track officials, promoters, and sponsors who have made a lasting impact on drag racing in Canada and elsewhere. Light, who is from Edmonton, Alberta, started as a driver in Competition Eliminator and then Top Fuel. He also owned and operated the Edmonton International Speedway from 1974 to 1982. Light has been with NHRA since 1984 and has held his current position since 1993. He was also inducted into the Canadian Motorsports Hall of Fame in Toronto in 1996. 2014 – Won eight Top Fuel world championship; five race wins; won the Traxxas Nitro Shootout. 2012 – Ninth U.S. Nationals win; came up short of winning championship by just seen points. 2009 – Won sixth consecutive Top Fue championship, the only driver to ever do so; won eighth U.S. Nationals. 2008 – Fifth consecutive Top Fuel world championship; tied Greg Anderson for most wins in a season with 15; appeared 18 times in final rounds out of 24 races; swept the Western Swing; nine times No. 1 qualifier. 2006 – Third consecutive Top Fuel world championship, fourth overall; 13-time No. 1 qualifier; five race wins, including fifth U.S. Nationals win. 2005 – Won third Top Fuel world championship; won five consecutive races; 11-time No. 1 qualifier. 2004 – Won second Top Fuel world championship; won 10 races, including his fourth U.S. Nationals victory at Indianapolis. 2000 – Debuted U.S. Army sponsorship at the U.S. Nationals and won the race. 1999 – Won first Top Fuel world championship; won first Top Fuel final at Dallas. 1996 – Ran his first NHRA national event and went to the final round. Some things most people don’t know about Tony: While Tony has never actually been in the Army, his long-time sponsor has sent him out on a wide variety of training activities, something that also helps him relate to the soldiers he represents. It’s apparently had an effect because when asked what sort of things he’d like to try, the answer is probably something his sponsor could arrange, like flying in a squirrel suit. When he’s not racing, one of Tony’s favorite things to do is ride his Harley-Davidson motorcycle. Crazy but in a very cool kind of way, Tony Schumacher talks about one of the craziest things he’s ever seen at the race track. Points by which second place Jack Beckman trails first place Del Worsham in Funny Car, the closest battle in the Pro categories and absolutely one to watch at Dallas this weekend. 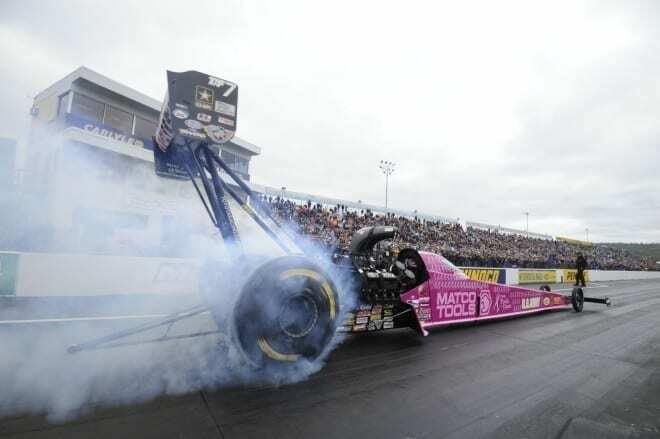 NHRA is back in action with the fourth race of the six race Countdown to the Championship this weekend, the AAA Texas NHRA FallNationals. Tune in on Sunday night.